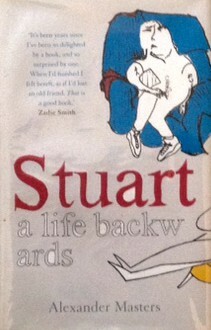 I read Stuart : A Life Backwards in 2005 when it was first published and it has stuck with me ever since. I’ve been prompted to do this review because the author, Alexander Masters, has just released his new book A Life Discarded: 148 Diaries Found In A Skip and before I go on to read that one I wanted to revisit Stuart because I thought it was a remarkable debut. How do you tell the story of a homeless man and the conditions that created him? There’s no shortage of journalism and academic journal articles, policy pronouncements and sociological tracts that try to tell us about the nature of homelessness. You’ll also find plenty of heart-rending stories – or case studies in the professional parlance – provided by voluntary and statutory projects who try and help put the homeless back on a more viable long term path to social stability. However, capturing the true nature of the human experience in the real voice of the homeless person themselves is a more difficult task. How do you present them as the real, rounded individual they are rather than the vulnerable ciphers that the label ‘homeless’ tends to make them? Masters solves this problem by writing about the homeless experience but doing it through the filter of an unlikely friendship. He is a middle-class, liberal, academically inclined writer and Stuart Shorter is an alcoholic, drug-fuelled homeless man with psychotic tendencies – what could they possibly have in common? Well, it seems they both share a passion to explain rather than to simply judge – homelessness happens for reasons beyond the obvious and to people who are both as chaotic and as eloquent as Stuart. Stuart is sleeping rough in a Cambridge shop doorways while Masters is working as a fundraiser for a homeless charity and the two are brought together when the organisation’s existence is threatened by the arrest of two managers accused of knowingly allowing heroin to be used on their premises. In the campaign for their release that follows, Stuart and Alexander, a decidedly oddly matched couple, work together and build a bond of trust and friendship which leads to Masters wanting to write Stuart’s biography. Stuart proves to be a difficult and prickly critic because he wants his life translated into a thriller – something Tom Clancy might have written. Masters doesn’t quite fulfil this aspiration but he does manage a page-turner in its own way by taking the traditional chronology of a biography and turning it on its head – going backwards from the present to uncover, layer by layer, incident by incident, the events that created the Stuart that Masters sees in front of him. Unsurprisingly, it’s not a pretty story. There is a history of abuse, illness ( Stuart has muscular dystrophy), incompetent teachers and a system that seems intent on letting down the people who most need it – and there is also Stuart’s own terrible decision-making and his odd priorities. Stuart’s story has no happy ending – and you probably wouldn’t expect one. Before the book was release he was killed by an express train in an incident that was declared neither suicide or an accident, just a mystery. At his burial Stuart’s life was celebrated by his friends with an impromptu graveside party at which the drink flowed freely. It could be argued that Masters’ book is a triumph of form over substance – his decision to structure it in the way he has could be easily be seen as just a gimmick that gives a novel shape to a life story we’ve heard too many times before. But that would be to ignore the richness of the experience of reading this book because it’s not just about suffering and misery – it’s also a joyous celebration of the friendship and the fact that that it can be found in the most unpromising situations. For me too it is an important reminder that our prejudices and stereotypes can and should be confounded by people when you come to know them as individuals rather than as symbols of social failure. And Masters is a good enough writer to be able to deal with issues like this and to do so in a style that is as idiosyncratic and individual as the speech patterns he is trying to capture. If you want to understand homelessness and its impact on people don’t go to government reports or studies by thinktanks, go to Stuart : A Life Backwards and experience the human reality.